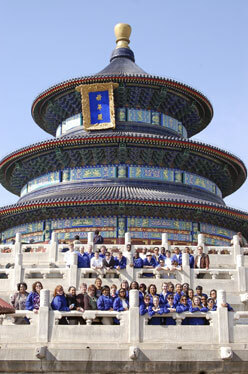 This undated photo provided by chaperone and parent Teresa Cleary shows Winton Woods Varsity Ensemble members and chaperones at the Temple of Heaven in Beijing. When she traveled to China with her son's school choir, Teresa Cleary spent a fair amount of time worrying that a student under her supervision might become lost or ill.
She did not consider another possible consequence: getting sued. A nearly $700,000 verdict against a chaperone of a cheerleading trip to Hawaii is enough to give a chaperone pause, said Cleary, of Cincinnati. "Whether it's a trip to the zoo with the first grade or a trip to China with a group of high school students, there's always an anxiety," she said. "I'm responsible for someone else's child." Add legal liability to the equation, and "I definitely think it could impact some people's willingness to chaperone." The Hawaii verdict came in the case of an 18-year-old high school student who fell to her death from a Maui hotel balcony. Lauren Crossan of Randolph, N.J., had traveled to Hawaii in January 2004 with Susanne Sadler, Sadler's daughter and another New Jersey cheerleader to perform in the halftime show of the Hula Bowl. Within hours of her arrival at the Hyatt Regency Maui Resort, Crossan was seen drinking alcohol. Her body was found the next day on the hotel grounds. An arbitrator determined last month that Sadler was partially responsible for Crossan's death and ordered her to pay $690,000 to Crossan's parents and her estate. Getting sued is a possibility the Blacksburg High School Band Boosters in Blacksburg, Va., have considered, said John Sills, who organized a band trip to Orlando, Fla., in April. The booster club is in "active discussion" about the possibility of purchasing liability insurance to protect parents, said Sills, president of the organization. Members are concerned about the possibility of lawsuits, he said. "If we decided not have any insurance, at some point a year or two from now, some parents might say they can't take the risks," Sills said. Jan Harp Domene of Anaheim, Calif., was grateful for the liability insurance provided by the California PTA when she was sued because a student broke his nose while slam-dancing at a dance she was chaperoning. Not all schools provide liability coverage. Concerned chaperones can also look to their homeowners policies, some of which cover accidents away from the home. Sometimes it takes an event like the Crossan lawsuit to draw attention to a potential risk, said Lisa Soronen, a senior staff attorney with National School Board Association in Alexandria, Va.
Once on the trip, parents should be vigilant about watching for potential dangers, added James Krueger, the Maui attorney who represented Crossan's family. Krueger, who would not comment on the Crossan case because of a court-imposed gag order, said parents could reduce their liability by enforcing the rules established by the trip's sponsor and using commonsense parenting skills. "If you're a good parent, you're not going to have problems," said Krueger, who has handled numerous cases of children injured while in the custody of someone other than their parents. "If you're a crappy parent, you are." The case was not unlike a wrongful-death suit that someone might file against a doctor, said Neil Vidmar, a Duke University law professor. "It's a tragic case, but it doesn't seem to me to be particularly unusual," he said.